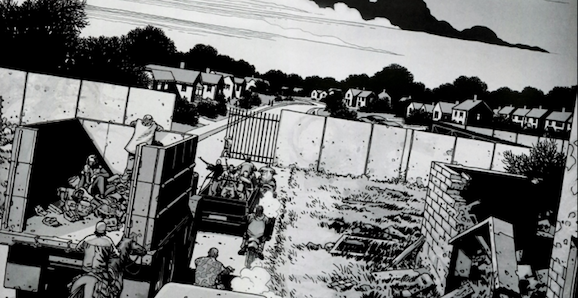 In the comic continuity, after the kerfuffle at the prison, an encounter with some cannibals, and a flurry of adventures on the road, Rick Grimes (Andrew Lincoln on the TV) and his merry band come to the walled community of survivors. They arrive in issues #69, but they’re actually still there now, using it as a home base in the battle against Negan and The Saviors, so the place has played a huge role in the continuing narrative. It really is the home they hoped that the prison would be. Given the trajectory of the series, and promises form the producers that the story will at least loosely follow the arc of the comics, this is a logical conclusion. The survivors have already left the prison, the unfortunate state of affairs at Terminus, which ended season four, looks like a stand-in for the cannibal thread of the story, so a stop at Alexandria, or at least some approximation thereof, could very well be in the cards. According to the reports, the wall encloses ten homes, four brownstones as well as additional residences, where roughly 30 people, actual citizens, not members of the cast or crew, will continue to live. There goes the neighborhood, indeed. Located in Senoia, Georgia, a suburban part of the greater Atlanta metropolitan area, the walls are scheduled to remain in place until November. The length of this installation seems to indicate that this area will play a significant part in season five. The Walking Dead has a propensity for dividing individual seasons into two separate story arcs, and since they still have the situation at Terminus to deal with, my guess is that thread will take up the first half, while whatever transpires in these new walls will occupy the latter portion. 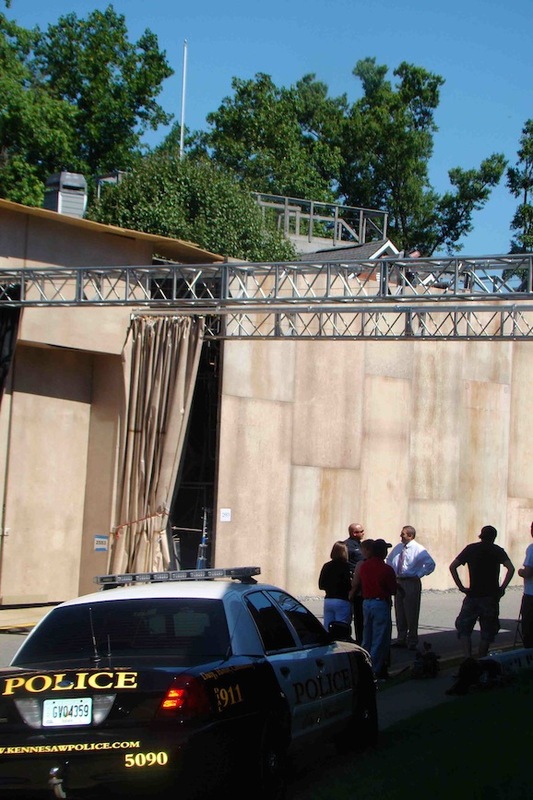 Larry Owens, the mayor of Senoia, says the city council approved the build, and also confirmed that the walls will serve to keep out the swarms of undead walkers the show is so fond of. The Walking Dead has always has a significant presence at San Diego Comic-Con, and this year is not going to be the first exception. On Friday, July 25, the show takes over the stage in the giant Hall H. There’s no word on what they plan to reveal, though there will likely be some new footage for fans to gawk at, but notable attendees include cast members Lincoln, Norman Reedus (Daryl), Steven Yeun (Glenn), Lauren Cohan (Maggie), Danai Gurira (Michonne), Melissa McBride (Carol), Chad Coleman (Tyreese), and Michael Cudlitz (Abraham). Executive producers Gale Anne Hurd and David Alpert will also make an appearance, as will showrunner Scott Gimple and special effects guru, director, and all around badass Greg Nicotero. Given the relative strength of season four, especially the final eight episodes, we’re looking forward to the new season more than we have any of the previous years. Lets hope the show continues to improve and lives up to expectations when The Walking Dead returns this October.